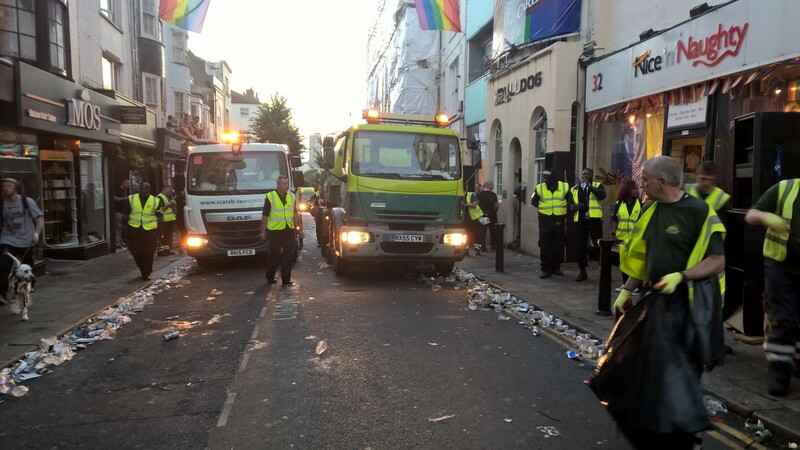 The city’s street cleaners and refuse collectors worked around the clock to pick up 12 dustcart loads of rubbish from Brighton’s streets during Pride weekend. 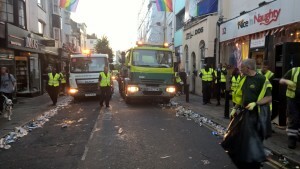 A team of street cleaners followed the procession and other CityClean staff worked in shifts until 2am to collect 120 tonnes of rubbish from the streets and litter bins, some of which had been installed along the procession route. The clean-up finished with jet washing of streets and pavements. Councillor Gill Mitchell, chair of the city council’s environment committee, said: “Our street cleaners do a tremendous job to keep the city clean during the busiest weekend of the year. The annual Pride festival is the biggest stand-alone event that takes placed in the city and is estimated to inject around £13.5 million into the local economy. Brighton and Hove City Council also thanked event organisers Pride CIC, as well as the emergency services and the army of volunteers who helped make the 25th year of the event such a success – despite the last minute parade reroute after the seafront bomb scare. Coun Mitchell, said: “It was a fantastic 25th Pride, probably the best ever and I’d like to thank the event organisers Pride CIC, Sussex Police, partners and volunteers who acted quickly and calmly to reschedule the parade. St John Ambulance provided more than 100 volunteers to give medical care throughout the weekend, the 16th year they have worked with Pride in Brighton & Hove. As well as the council’s own events and seafront teams, staff throughout the organisation provided support for the event, from children’s services which set up outreach support for young people, to transport which managed the road network. The council’s tourism arm VisitBrighton welcomed a number of LGBT travel journalists from around the world to the city over the Pride weekend, including Brazil, USA and Germany. Acting chief executive Geoff Raw said: “This is a great example of a community led event that brings enjoyment and economic benefits as well as showcasing Brighton and Hove as a city of fairness and equality. What a pity that following the incredibly efficient and professional setting up of the Pride Camp at Waterhall the travellers took advantage of the temporary access points and have set up a huge encampment to the detriment of Council Tax payers who enjoy this amenity. Sadly, the whole area is now out of bounds. Not a single prosecution for litter in that 120 tons of discarded waste on our streets. Had they been illegally parked motorists, the council would have raked in £££millions.